Describe your piece objectively, including the size, materials, and form. Be as accurate and specific as you can without trying to explain its meaning. My piece is around 7″ hight, 14″ long, and 9″ wide. 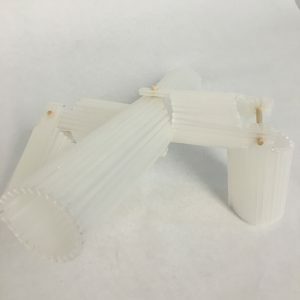 I used frosty corrugated plastic, and wooden dowels. 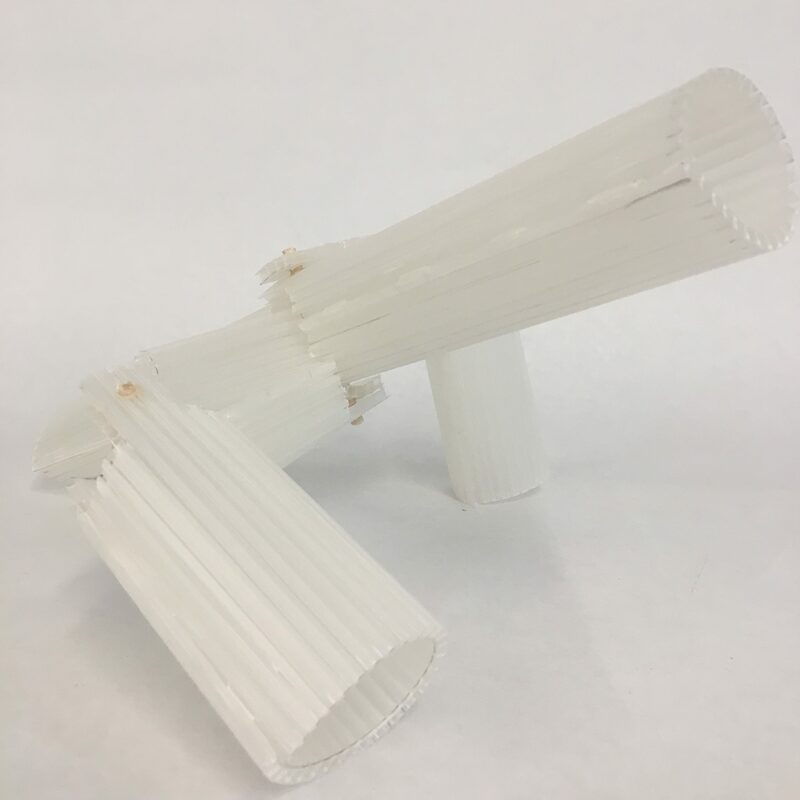 the corrugated plastic is scored to bend into a cylinder, then they’re connected with wooden dowels creating a moving joint. Discuss your inspiration for the piece: what objects did you work from and how do they contribute to your participation and sense of belonging in communities? Which formal qualities of your object(s) did you combine to create an abstract sculptural artifact? My first object is a skateboard truck with a pair of wheels still attached to it. It shows what kind of activities I participate in, and my role in my community as an outsider; for I chose the lifestyle to dress and act comfortably enough to be skating most of the time. I’ll take the idea of the wheels and their point of attachment or the idea of a moving part and include it in my piece so it looks like it could be viewed upside down too like in a skateboard. My second object that I’ll be incorporating in my design is a lighter. It also shows my role and activity in my community as an outsider. The “contained and hidden” fire indicates the power of the voice, as it only comes out when it’s needed. It also shows the wisdom of an outsider in my community, as they only speak up when they need to, and at safe rate. I’ll be using the overall design of the lighter; the simplicity and balance of the overall design. As it has a negative space in the middle but also a very complex design on the top. Explain how your sculptural artifact uses planes to engage and define positive and negative space. How did your understanding of 3D space evolve through the planning and making of this project? Include concepts and vocabulary introduced in class (see project sheet). 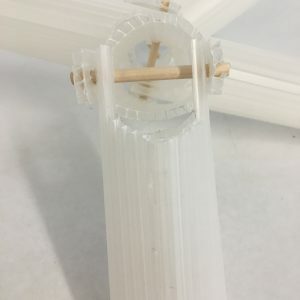 Since I adapted the simple shape of the lighter to all my plastic pieces that shows negative space and I also took the wheels’ mechanical movement. Explain how you chose the materials to make your sculpture, and what information they give the viewer about your sense of community. i used plastic and wood. These two materials are opposites, but they match perfectly together. As the plastic resembles a modernized artifact feeling to the piece, while the wood resembles earthy, organic, and cultural feeling to the piece. Community is basically a combination of organic/cultural and artificial/urban elements. Describe the processes, skills, techniques, tools, and joints/connections you used to make your project. Reflect on one area where your craft is particularly strong and one thing that could be improved. I scored the corrugated plastic to form a cylinder shape. I made the holes in the plastic using a hot wood-burning tool. Then i attached the pieces used wooden dowels. Conclusion: How is your piece an artifact of your communal/community identity? …If an archeologist found your piece in 500 years (in tact), what could they deduce about your sense of community? I believe that community is mix of everything wither its modernized and urban or ancient and organic. But regardless of what components that make our community, wither they’re good or bad, everything fits perfectly together and that makes all relate to each other living in one space.